With just days to go until the season 8 premiere, HBO dropped two new promos, “Together” and “Survival,” as well as a new teaser, “Aftermath,” to get fans hype for Game of Thrones‘ return. Of course we cannot wait, "Our blood dey hot bad bad sef". In six weeks from today, Game of Thrones will come to an end. By then, our beloved Tyrion Lannister will be killed in the series final hours. No, my predictions doesn't come from a stolen script or a source deep inside HBO. My predictions is from my head. Throughout the past 7 seasons (Game of Thrones), Tyrion Lannister has mesmerized audiences with his bravery, integrity, darkness, and wit. His father hates him, his sister want to kill him, and his beloved brother pity him (his own words). 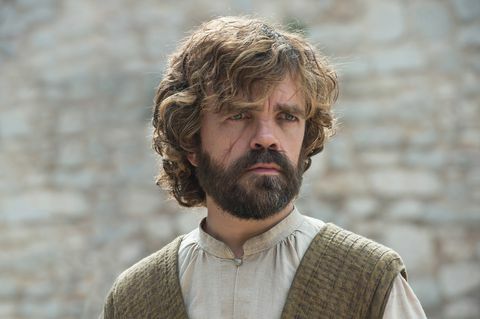 Introduced as a cynical, drunken womanizer with strong ties to his sleazy family, Tyrion began the show one-dimensional and on the wrong side of history. But as the realities of his marginalization came into focus, shining a light on his tortured existence, he became deeply cherished by all of you. He's traveled to The Wall (just to piss from the edge of it - as promised), defended King's Landing in the Battle of the Black Water, served as Hand of King Joffrey (the best man to ever occupy that position), demanded a trial by combat, wrongly stood trial for the murder of his nephew, killed his own father, traveled in a box to another country, fought his way out of slavery in a foreign land, and now serves as the Hand of the rising Queen Daenerys as he march her back to his country to dethrone his sister. What a man! Tyrion is beloved not just by you but by all of us, ask your friends who their favorite Game of Thrones character is, they will probably say Jon Snow because he is a beautiful young man. But, when you take the King in the North out of the picture, over 90% will choose our little Lion, Tyrion Lannister. Tyrion's character is strongly linked to every character left in Westeros (remove Greyjoy) - and that's exactly why he won't survive the series finale.